The 2016 Paris-Roubaix champion retires at age 40 at the end of his home race, the Santos Tour Down Under. 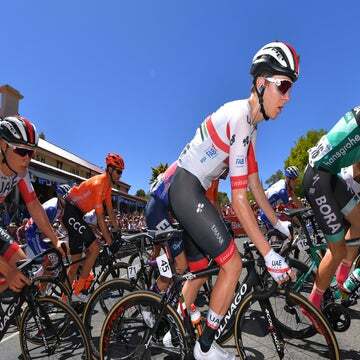 ADELAIDE, Australia (VN) — Mathew Hayman was all business until the final climb of the final race of his career. The 40-year-old still had a job to do to protect Mitchelton-Scott teammate and double champion Daryl Impey in Sunday’s finale at the Santos Tour Down Under. Once he hit the bottom of the Old Willunga Hill, his job was done. And the countdown began. He eased off and slowly pedaled up the 2.9-kilometer summit. Riders patted him on the back as he floated out of the back of the group. His family was waiting at the top. Once across the finish line, his career was over. Hayman, who became Australia’s second Paris-Roubaix winner in 2016, decided over the winter to end his career on home roads. He wanted to race at the Tour Down Under and close his career where he started racing in the 1990s as a teenager in Canberra. Ever the professional, Hayman raced hard and worked for the team until the end. Hayman was the consummate professional and spent most of his career working for the good of the team. He bounced around from some of the biggest in the peloton, with stints at Rabobank and Team Sky before landing with Aussie outfit GreenEdge in 2014. His career started in 2000, yet he only won three races. One was a real doozy, when he beat Tom Boonen in the 2016 Paris-Roubaix. Hayman revealed that he actually apologized for winning Roubaix and preventing Belgian star Boonen from winning a record fifth cobblestone trophy. The Roubaix win stands out for Hayman, who often served as a road captain, a loyal domestique, and the occasional leader in the northern classics. Roubaix was the race he loved. Hayman won’t stay away from cycling for long. He’s already signed on to serve as a part-time sport director and mentor for Mitchelton-Scott. What did he plan to do Monday morning when he woke up without having to race or train for the first time since his 20s?